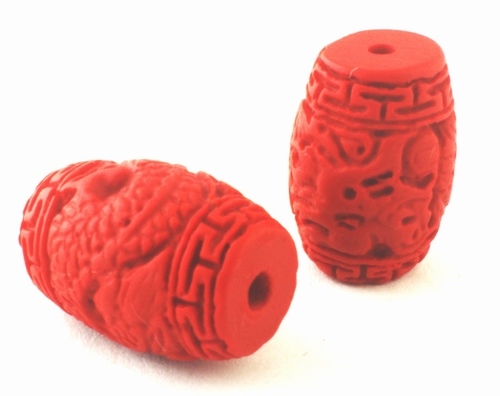 Price is per four of these beautiful beads, each measures 17mm x 12mm, crafted from reconstuted cinnabar. The toxicity of mercury and cinnabar was well known before 2000 B.C, when slaves and prisoners mining the ore died after three-years. However, the Chinese during the Song Dynasty, reduced the risk by using lacquer over the cinnabar carvings onto chests, candle sticks, snuff bottles and other ornaments. Today, the toxic pigment is replaced by a resin-based polymer that looks the same as the pigmented lacquer. Most beads and jewelry sold as cinnabar now, consist of a carved wood base covered by layers of resin, and are totally harmless.